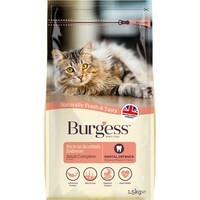 Burgess Adult Complete Cat Food (Salmon) has been made using premium ingredients to ensure an excellent quality diet for adult cats with a superior taste. Nutritionally balanced for your cat's needs, the food combines healthy cereals, natural antioxidants and essential nutrients with a great British protein source to help keep your cat happy and healthy. Burgess Adult Complete Cat Food also contains a specialist ingredient to reduce plaque formation and support healthy teeth and gums. My cats like this as much as some costier brands and it keeps them full for quite a long time. Definitely will be ordering again. My cat is finicky. Apart from Royal Canin, this is the only cat food that he will eat. He even turns his nose up at expensive, luxury tinned cat food. I was very relieved when I discovered this product at an excellent price as I could no longer afford to feed my cat fillet steak. Four stars - My cats like this but not as much as they love Royal Canin Fit 32. On the plus side, it is British owned and much cheaper than Royal Canin but with comparable ingredients. I'd buy it again easily.